How can we learn from the Commons project on Flickr and use it as a benchmark to develop policy for allowing our collections to be used under open access? How do we measure the success, maintain our new community, progress with better access to our collections and develop new business models? Traditional image-licensing models in key cultural institutions are usually developed around the principles of conventional print publishing and seem outdated with current on-line technologies. Over a decade ago Trant identified a rapid need to exchange information quickly and globally through online technologies (Trant, 1996) and that traditional licensing models were no longer sufficient. Will traditional image-licensing models see museums into the future and if not, how will organisations change policy with the need for fast and efficient dissemination of content? Collecting institutions in New South Wales charge for the right to use an image for educational and commercial applications in a variety of ways. There may be a reproduction fee applied to an image that is out of copyright, particularly for commercial applications while others may waive the reproduction fee but charge an equivalent in an access fee. There is not a standard model across collecting institutions for the licensing of images possibly due to the many complications with copyright, creators, income requirements and access priorities. Photo libraries provide a great resource to enable learning and the museum sector is in a position to support the education sector by allowing images to be used in an educational manner without additional cost, yet our business models currently don’t support this to the level that is required by such communities. The education sector is a great source of potential innovation and creation using high value, authoritative and trusted content that exists in museums yet the fees for access and reproduction are too high for the majority of educational use. There are few traditional forms of licensing models that actively support open access whilst also allowing for income generation. A problem with traditional models is that open access to museum content is not typically an accepted form of policy. Under resourced and poorly funded institutions also rely on some form of additional income that is generated towards the expensive activity of maintaining a collection and the staff to catalogue and document it. Very few institutional models have been developed to allow content to be accessible for the education sector (Pantalony, 2007). Institutional photo libraries can be set up with a commercial structure to follow as a priority for licensing image content which seems to be in opposition to institutional mission statements of providing access, promoting the collection and educating the public that ultimately fund the organisation. The commercial factor may not be the intended prime driver as Tanner revealed in a study about the cost and policy models of 100 art museums across the United States that resulted in the primary reason institutions deliver and manage image services is to serve the public through educational use of content (Tanner 2004). This primary aim may sometimes be skewed through income often being deemed essential within funding shortages. A recommendation of the study was that institutions review their imaging and rights priorities to clearly represent the mission of the museum. The Powerhouse Museum has an extensive collection of images in its Photo Library that are licensed for use in publications, exhibitions, educational papers, online, in documentaries, for DVDs, for commercial applications and scholarly use. It holds hundreds of thousands of reproduction quality images of the collection as well as stock library material that has been photographed for use in publications, events, exhibitions and behind the scenes of the Museum. Powerhouse Museum images are licensed to a variety of clients including students, academics, cultural institutions and publishers and are reproduced in a variety of ways. There is currently a ‘one size fits all’ approach to charging for the use of these images with the exception of a 20% discount offered for educational use. There exists a small amount of content created by the Museum photographers available on the Web site that is licensed under Creative Commons. The annual income generated from accessing and reproducing the images is relatively low compared with other income streams in the organisation. This low income should remain a key factor in reviewing the public’s interest to have access to the content we collect and create. The resource cost of making this content available will never equate to a profit status. Providing better access through a new business model will enhance and promote the brand and collection whilst allowing the education sector a much-needed source for learning. So how does this model change? Australian collecting institutions are at a critical point where traditional licensing models need to change in order to support and reap the benefits that open access to our content will provide with particular emphasis being on the education sector (Pappalardo, Fitzgerald and Austin, 2008). The Commons project is an example of change that has provided the Museum with the measures to highlight benefits that can occur when collections are accessible and available to use with no restrictions. This project has the added benefit of cross-collection search that enables the public to have better access to a variety of content that leads to a more informed level of research and discovery. The question is how do we take the findings from this level of access and let other communities gain a similar experience through the learning and sharing of other collections. The principle of open access, similar to the objective of the Commons on Flickr, has not been key practice in cultural collecting institutions in Australia and can be difficult to persuade certain divisions within institutions of the benefits (Kelly, Ellis & Gardler, 2008). Open Access has gained significant attention internationally in recent years yet there is still a greater need for cultural institutions to take this on board and make some policy changes to realise the benefits that come from allowing the public to have better access to content. There is global benefit for the public to have access to all our collections to enable rich research and encourage innovation, something experienced in the Commons project. There are a number of Australian universities that have adopted open access policies but very few cultural institutions have joined the ranks. Some of the university policies are still being developed but provide a good record of how these principles are being applied to the education sector (Pappalardo et al., 2007). When a museum is a trusted source for its content and provides access freely for educational purposes there is generally a return in exposure and promotion of the collection that can improve the institutions position for partnerships and funding (Browne, 2008). Partnerships can provide a critical component for potential funding initiatives that can help towards the high cost of digitisation whilst also assist to form on-going collaborative projects. Hudson and Kenyon have identified that museums, libraries and galleries undertake the digitisation of their collections for a range of reasons including preservation, documentation and most importantly to provide ongoing access to this content for the future (Hudson and Kenyon, 2007). But if this material is not accessible then what is the future for this content? Are collecting societies providing reasonable means by which creators can choose to use open content licensing? If they are not, then as with the creation of greater certainty for public domain dedications and commons licences, the question needs to be asked whether the Copyright Act (or the code of conduct of the collecting society) should both create a right to do so (where one is needed) and to specify an appropriate formality by which it may be exercised (Greenleaf, 2007). With the increase for the demand of high value digital content the sector needs some alternative licensing models that are going to alleviate some of the escalating costs to accessing content. However the need to comply with copyright is one of the most problematic areas for a museum to manage in a digitisation project that can ultimately influence the type of content that is selected. “Copyright has had a significant impact on digitisation practices to date, including in the selection of material to digitise and the circumstances in which it is made publicly available” (Hudson & Kenyon, 2007). This can mean that content free of copyright or with less complications ends up being a priority and may not reflect the overall collection of the institution. There are complications to licensing images, particularly surrounding copyright and multi-layered rights, that make it difficult to provide access to content and this is a significant challenge for the adoption of new business models supporting open access initiatives. Trant has stated “By their nature, imaging systems require a complex balancing of the interests of numerous rights holders in protecting their intellectual property and the desires of image users to use images in their study, teaching, and research” (Trant, 1996). These strategies vary across institutions and collections making it difficult to adopt a standard model for all. In Australia the copyright act doesn’t have a general “fair use” defense like it does in US copyright law. The act does allow for “fair dealing” for certain purposes if only a small portion of the work is used or if it falls under satire and parody (Australian Copyright Council, 2008). “Given that fair dealing is also limited, cultural institutions have relied on other strategies in their public digitisation activities” (Hudson & Kenyon, 2007). Images can be used under part VB of the copyright act for educational purposes only if an institution is defined by the act as educational and is covered by a remuneration notice with CAL. An amendment to the Copyright Act, section 200AB, specifically for collecting institutions such as libraries, galleries and museums (Australian Copyright Council, 2008), came into effect on 1st December 2006. The reported aim of this amendment is to allow flexible exceptions when using copyright material for specific purposes. This new amendment may hold possibilities and provide flexible exceptions for collecting institutions to allow some form of “fair dealing” in consideration of licensing content under statutory dealings and for problematic orphan works. However it has not been utilised by institutions to change policy or licensing business models, being that it is relatively new and not fully understood. There is a strong need to “establish easy to implement generic non discriminatory protocols for access to and reutilising or reusing of content – a process of “licensing out”. Make it easier to negotiate out or access copyright material (Fitzgerald, 2006)”. Australian cultural institutions need to seek collective advice on the new provisions in the Copyright Act that may provide a solution to allowing better access to digital content. “Institutions could develop policies that clarify which material and which uses they believe are covered by the new flexible exception” (Hudson & Kenyon, 2007). The on-line environment has dramatically changed the need for more efficient and fast delivery of digital content. Traditional requests for the right to reproduce an image can take a minimum of a few days to turnaround. Firstly the content has to be located, may need to be scanned, copyright cleared, payment made and then a digital file can be released. The slow ‘one size fits all’ approach to providing images is not being reviewed with the current demand for fast return on authoritative digital content. The costs to administer content generally aren’t equivalent to revenue and not factored into income projections. If institutions aren’t digitising for supply and demand then the question needs to be answered of whether we really know what the audience wants. Do we know what our audience want if there is a gap between the services we supply and the markets need for efficient and fast content (Wall, 2003). The gap between market and supply can become wider over time when there is no form of linking the two without tracking methodologies. It is difficult for the sector to renew and adopt new business models when additional funding is an essential element for digitisation particularly when the general global economy is down. The Art Museum Image Consortium (AMICO) that existed between 1997 and 2004 supplied images of various resolutions to educational (primary, secondary and post-secondary institutions) under educational licenses. This model was established after the experimental Museum Educational Site Licensing Project (MESL) explored ways to address the lack of resources available for educational use, manage complicated rights and licensing and address the need for infrastructure that could collate and deliver materials. This project, one of the first to address the need for digital content to be accessible via a group of works under a standard license, made a significant contribution towards the need for educational use of digital museum content, and brought to light the issues surrounding complex rights and delivery needs (Bearman and Trant 1998). The MESL project, along with 40 representatives from North American art museums, contributed to the formation of the not-for profit and independent membership organisation AMICO. The primary aim of AMICO was to collate and distribute digital material for educational use; it was a not-for-profit and was not a commercial model. It provided an opportunity for the contributors to discuss issues together and openly whilst also recommending metadata standards for multi-media files. This model was an example of aggregated museum content being made accessible for the primary benefit of educational use. This organisation managed to start with 22 museums across the United States and Canada and within the first two years drew 120 college and university subscriptions with around one million students having access to the collections (Trant, Richmond & Bearman 2002). The benefit of this scheme was to provide a central repository for museum collections and a new way of delivering content (Pantalony, 2007). AMICO however dissolved in 2005 even though it was self supporting and had no debt at the time of its demise. To date the collections that this organisation helped to create are still being distributed albeit not under AMICO. Similar to AMICO’s aim is the digital library Artstor that houses over 100,000 images and is a resource set up for research and academic purposes for a variety of educational institutions. Universities, schools, museums, libraries and colleges access this resource and images can be downloaded and used by individuals from each participating institution (Artstor, 2009). This model is very interesting for the museum sector with particular reference to its goal of disseminating collection content and information, something that AMICO was initially set up for. Museums get to provide their content whilst also utilizing the collections from other institutions. Artstor is experimenting with new models such as the Images for Academic Publishing (IAP) licensing terms and conditions set up in conjunction with The Metropolitan Museum of Art. This is a scheme that aims to reduce the costs of publishing images to the academic community by allowing free high-resolution images to be used for scholarly purposes whilst also linking each record to the participating institutions rights and permissions page of their Web site so the potential for commercial applications is available. This scheme has influenced the Victoria and Albert Museum to utilise aspects of this approach to licensing images for their scholarly initiative. In 2006, the Victoria and Albert Museum, previously an AMICO member, announced that it would drop fees for reproduction and distribution of its images to the education sector for scholarly use (Lewis, 2006). Utilising core principals of AMICO’s scholarly license, the distinction between commercial and academic, community based publications was highlighted effectively. Scholars can download high-resolution content to be used in an educational application under a range of fair conditions for free. The decision was based on a need for the wider dissemination and attribution of the Museums collection with over 25,000 objects made available on the Web site for this purpose. The previous income generated from the reproduction fees was reported to be approximately £250,000 a year but the costs to maintain this brought the figure down immensely (Pantalony, 2007). The decision to allow better access was not based on a commercial business practice rather to gain in reputation, brand, positioning and promotion with the premise of effectively supporting the educational community. The high cost of purchasing images with the previous model was seen to be a barrier in the distribution of knowledge (Jones in Lewis, 2006) particularly for the disadvantaged community that required more support. Not only was this move in order to support this community but also provided the opportunity for the Museum to reap the promotional benefits of a good business decision. Whilst offering free images for scholarly purposes the V&A also promote their online print production service that caters to the commercial market providing an effective income stream (Victoria and Albert Museum, 2009). The divide between commercial and educational use has been clearly defined. The Tate Gallery in London has also adopted a similar business model by providing images free for educational use whilst also maintaining the traditional method of licensing images for reproduction to the commercial market. The gallery has been able to attract a major partnership in the telecommunications giant British Telecom due to its on-line presence through programming and initiatives such as its licensing model (Pantalony, 2007). It has an international on-line presence in which the image bank has been a major contributor. British Telecom has assisted with the financial help required to provide more image content to make available for education and public outreach. The implementation of Creative Commons licensing has been extremely important in the dissemination of content and to enhance knowledge, which has been a crucial development in the digital age and for open access. An Australian version of Creative Commons licensing has existed since January 2005. This is a flexible tool for creators to provide conditions on their work to allow others to share, apply and modify work providing it is properly attributed. Creators can specifically chose a non-commercial license so that work may be used for educational purposes. This model has been crucial in the acceleration of disseminating content leading to innovation (Fitzgerald, 2006) something that the Museum has experienced with the images in the Commons project. The development of this form of licensing comes at a time when at a policy level the Commonwealth is also concerned to see that the results of publicly funded research are available in a more open and generally accessible way than they have been to date, particularly where research outputs are the subject of monopoly approaches to the assignment of copyright in publishing (Fitzgerald, 2006). On April 8th 2008 the Museum loaded 200, high value images from the Tyrrell photographic collection onto the Commons project on Flickr. These were images that we sold digital copies of since they were acquired by the Museum in the 1980s. The collection consists of 7903 glass plate negatives from the studios of Charles Kerry and Henry King who had two of Sydney's principal photographic studios in the late 1800s and early 1900s. The 200 images released to the Commons had been on the Museums Web site for many years receiving steady visitation and inquiries to purchase for reproduction. This collection was rarely exhibited and no major publication had been produced on the Sydney-centric content. The Powerhouse Museum is not known for exhibiting two-dimensional works, there is no dedicated gallery space and photography and photographic works in the collection have rarely been promoted prior to this project. Being the first museum to join the Commons project drew reservation from some parts of the organisation because there were no measures or statistics and no other project of this scale or access was previously implemented. The effect this was to have on images sales was not quantifiable yet it was an ‘experiment’ that was eventually approved bearing in mind there may be a drop in income. Nearly a year into this project there are over 1000 images in the Commons, there are measures, statistics, collaborative projects, a steady interest in image inquiries and sales and knowledge the Museum holds photographic works but critically the realisation that a new business model for licensing images is essential. The aim of the Commons is to allow members of the public to add tags, comments, use, share, discuss and generally make publicly held photographic collections richer and accessible (Flickr, 2008). It is a place where the Flickr community can share and learn about the historical content from the various institutions collections that may never have been accessed via their own Web sites. An objective of the Commons is to make collections richer through the various comments and tags provided by the wider community on Flickr that in turn can be re-ingested back into the institutions Web sites. This increases the awareness of the collection and can also lead to the knowledge of other collections that the institutions posses. The institution gains an understanding of the type of content that is being used and can learn from this engagement whilst also benefiting from the additional information about the historical collections provided by this community (Springer et al., 2008). The Commons project has been one of the first examples of Powerhouse Museum content being freely accessible on-line. The images from the Tyrrell photographic collection loaded to Flickr had been available on the Museums Web site for a number of years albeit not downloadable. The traditional method of accessing this content was through the photo library after a fee was paid for the right to access the digital files and prints. This provided a level of control for the Museum in relation to reproduction, something that had to be discarded through open access on Flickr. Giving up control of the knowledge about reproduction is not an easy undertaking for a collecting institution especially with the policy of ‘pay for access’ that enables this control. The knowledge about how Museum content is utilised is an important asset to the organisation and a measure often hard to track in open access initiatives. There also exists the complexity of allowing access to historical images that lack documentation and cataloguing that will always be problematic for collecting institutions as percentages of content catalogued is usually low. Participants of the Commons undertake a level of cataloguing through the tagging, additional notes, comments and research that may never be completed in the traditional method of museum registration. Using the ‘not-fully catalogued’ Tyrrell collection meant that we could gain an understanding of the type of user-generated cataloguing that would exist with this type of access. This is a significant change in policy that can be used as a measure for future applications. The extent to which we acknowledge the benefit of community contributions to enhance original, institutional content should have an affect on the type of business model implemented (Stacey, 2007). Allowing the Tyrrell collection to reach this wider community has meant a four-fold increase in visitation that has been beneficial to our new global audience but also to the Museum in terms of promotion. The project has provided a springboard for discussions on the effects of releasing material so openly and how it impacts on the traditional business model of income produced from the reproductions (Bernstein in Graf, 2009). This is an important decision for an institution to consider when allowing open access to content that provides a form of income. Based on the statistics we have on Tyrrell image sales and inquiries so far, there has been no detrimental affect on income produced from the sale of Tyrrell images since joining the Commons on Flickr. Our figures over the first year show that there has been a similar interest to previous years for requesting reproductions and prints. This is a critical measure for the Museum in terms of applying an open access initiative for the future. If sales can remain the same then the question of income generation needs to be addressed as either neutral or potentially beneficial. Is the increase in visitation equal to an increase in promotion, which fuels a desire to purchase a file or print? These early statistics highlight a much-needed form of documentation that may influence policy change perhaps cross-institution. 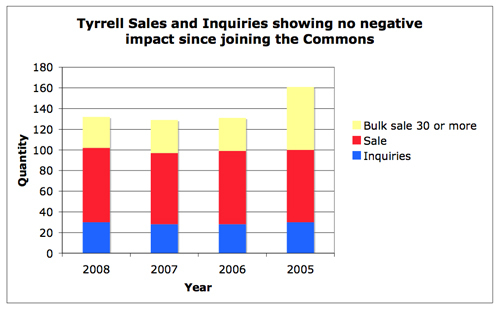 Fig 1: Sales and Inquiries of Tyrrell reproductions from 2005-2008. The access the public has had to the photographic collection, and the exposure, has never been greater than in the Commons. In the first day there were over five thousand views and the first five weeks was equivalent to all of 2007 of the same images on the Museums Web site (Chan, 2008). The Flickr community is informed about this collection and that the Museum has other photographic collections in its possession, an important outcome for the institution not known for photographic collection content. This is now projected as twenty times more views in the last twelve months. How do we measure the value of the increased visitation and promotion of the collection and equate this back into the Museums reputation? The Commons project has provided collecting institutions with the statistics required to discuss the risks and benefits of allowing content to be made freely available. This much needed data can be utilised to rethink other methods of allowing collections to be used in similar circumstances. The promotional return from the attribution of collections and the integrity of providing content to the public in an open access initiative should outweigh any small fee gained from the traditional method of licensing images. The value of promotion of the brand and reputation of the Museum through the vast increase in views, participation, engagement and knowledge about the Museums photographic collections should be considered as a significant measure to evolve from the Commons. So what has been discovered since joining the Commons leading us to rethink the traditional image-licensing model? The question has been raised about whether to base our image-licensing models on projected income or better access? The projects, collaborations, comments, tags and research that the Museum, and our audience, has gained possess great value that it is hard to measure this against traditional, image sale statistics and income. Three months after the Commons project was initiated there were statistics and a good indication of audience participation and connection (Chan, 2008). Visitation was much higher, tagging and comments were of value with these being re-ingested back to the Museums Web site to enhance further search capabilities. Innovation, research, community engagement and discoveries were being made and these are important indicators for the need to review the traditional model. A significant outcome for the Museum has been the development of a partnership with ABC Innovation through the Sydney Sidetracks project. 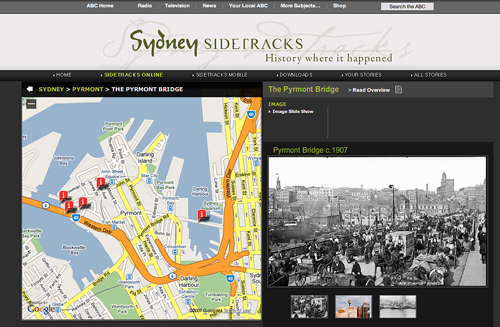 This is an on-line and mobile application for downloading historical content to explore locations around Sydney using images, audio and videos from cultural collections (ABC, 2009). The ABC, situated down the road from the Museum, has been utilising images from the Museums photostream on the Commons to augment the experience of revisiting historical areas around Sydney. This has led to an important partnership for future cross-institution collaboration. This is a critical measure for the Musuem to have established a partnership through allowing content to be used for projects developed outside of the organisation. Fig 2: Screenshot of ABC Sydney Sidetracks project (ABC, 2009). The Commons project has lead to a range of important discoveries and innovation such as the Powerhouse street view mash up by Paul Hagon (2008) where he has utilised the geo-coded images and matched them with Google Street View for a great example of ‘then and now’ comparisons. Fig 3: Screenshot of Powerhouse street view mashup (Hagon, 2008). There is the on-going social media connection made through a member locating the ‘Mosman Bay Falls’ image that has been a qualitative finding leading the Museum to learn from a users perspective about what it means to have access to this content. Meade highlights his view about accessing content that has ‘no known copyright restrictions’ whilst recognising the institutional need for income. I regard it as my heritage and everybody else who's here. And also it should be available for research from overseas as well. So yeah, I think it's my right to use it . . . But I also understand that there are financial constraints involved in the mere act of trying to release them. It costs money to do that. (Meade in Chan, 2008). This social media connection has also led to findings about on-line visitation with a connection to visiting the gallery space (Chan, 2008), something that is difficult to quantify in traditional statistics. With the development of partnerships, innovative projects, user-generated research and connection with the Flickr community the Museum will be reviewing the image-licensing business model that has been utilised for many years without review. The Powerhouse Museum will be investigating the new provision in the Copyright Act to determine what exceptions are ‘fair dealing’ for cultural institutions such as libraries, galleries and museums. Their will be a review of our acquisition license agreements with copyright owners to permit holders to allow for options when signing rights to the Museum so that content can be delivered on-line and free for educational use. This may take the form of a Creative Commons license similar to the choices provided by Flickr members to change the default of the automated copyright symbol to a flexible option (Greenleaf, 2007) provided there is correct attribution. The Museums aim is to provide downloading options for the specific purpose of research and study for scholarly and community applications using tracking methodologies. This will enable the sector to freely use Powerhouse Museum content as a trusted, authoritative source without having to pay reproduction fees and the escalating statutory licensing fees. There will be statistics on the use of the images for the first time and an indication of the type of content required by this sector that can influence further digitisation projects. With the global problem of the economic downturn and in general, institutions require different methods of producing income to fund the multitude of expenses necessary to house, maintain and digitise their collections. With the relinquishing of some income from reproduction fees we will be exploring fine art printing options that can cater for commercial applications and one-off use, similar to the way the Victoria and Albert Museum in London has achieved with its V&A prints on-line service. This should have been implemented at the time the Commons project went live and is seen as a downfall and a missed opportunity due to a lack of resources. It is these potential opportunities that need to be acknowledged when planning future image-based projects. We will explore creator remuneration from the sale of any prints with current copyright owners of works in our collection and copyright budgets will be negotiated at the onset of new digitisation projects. It is important for the museum sector to develop nurturing relationships with creators and share the benefits of any income gained from their work, which in-turn may encourage free-for-education use. With the documented benefits from the Commons project and our wish to assist the education sector a report and recommendations for a new business model will be presented for approval. There are complexities in making any new business model work particularly when the on-line environment is rapidly changing. The challenge for museums is to make adjustments and change with the fast pace of technology to ensure that business models that are adopted reflect the current need the public requires for fast and efficient access to government funded collection content. There are questions that need to be answered in relation to traditional image-licensing business models for accessing content. Will we see a change in traditional image-licensing business models cross-government that will support the education sector to reduce the over burdening statutory licensing fees? Will these new models be flexible to allow for commercial applications in an environment short of funding? Will we have creator remuneration schemes that nurture relations with creators and collectors? Will institutions have resolution on the complicated provision in the Copyright Act 1968 that may provide some answers to the problematic issues surrounding copyright in Australia? What happens to content if traditional licensing models don’t change? The Powerhouse Museum will be changing its traditional image-licensing model, utilising some of the key principles and outcomes of the Commons project as a measure, to develop a new business model for better access to digital content. The aim is to benefit the public and the education sector, whilst also experimenting with income streams. The Commons project has allowed us to evaluate how we can utilise on-line communities so that our collections can reach a far greater audience and therefore has set a benchmark with documented successes to allow the Museum to think differently about how we engage with our audiences and improve access to our content for future applications. This paper was developed with the assistance of the Powerhouse Museum Life Fellows Staff Development Award 2008, generously donated by Mr Frederick William Millar AO CBE. Wall, G. “Business model issues in the development of digital cultural content”. First Monday, volume 8, number 5. Published May 2003 at http://firstmonday.org/htbin/cgiwrap/bin/ojs/index.php/fm/article/view/1056/976. (Accessed 29th January 2009). Copyright © 2009 – Archives & Museum Informatics – All rights reserved.